Health care in the Niagara region (especially St. Catharines) should no doubt have been an issue in the federal election. It's amazing how poor emergency room health care is -- in this city especially. I am a St. Catharines native, but I am currently a journalism student at Humber College in Toronto, and I have had experience at hospitals in the GTA. In my experiences at emergency rooms in Toronto and St. Catharines, there is no comparison. Something that disturbed me greatly was an experience this Thanksgiving weekend, when a relative was experiencing chest pains and was sure he was having a heart attack. Family members rushed him into the St. Catharines General Hospital at 5 p. m. Saturday, and didn't receive any attention, or even get a room, until 1:30 a. m.
It was later discovered he was suffering a heart attack for the whole duration of the wait. This is truly unacceptable and heartless. Although we have what is considered to be a privileged health-care system in Canada, and it is understood many other people are in need of emergency care, this cannot go on. This is human life we are talking about! The attention at the federal level should be on reforming the Canada Health Act, shouldn’t it? Health-care is primarily a PROVINCIAL responsibility and obligation. Why aren’t the McGuinty Liberals reforming their disastrous Commitment to the Future of Medicare Act? Why aren't Liberals held accountable for incidents such as the one documented by Blay? Liberals like to pretend that these kinds of incidents are merely anomalies; they are just hearsay, just random, anecdotal stories! Liberals don't want to acknowledge the kind of health-care horror story which Blay wrote about! Local St. Catharines MPP Jim Bradley ran in the 2007 election pretending there were no problems with health care in Ontario! Now Blay - along with so many others - is discovering the charade of relying on the Liberals for health care; and of being prevented by Liberal provincial law from being able to choose other health care provider options when the government fails to deliver timely care. Why doesn’t Blay ask where the billions from Dalton McGuinty’s Health Tax have gone? How much "more money" should "government and citizens" have to pay? Why is Liberal-run health-care poor and appalling? Why isn’t Jim Bradley held to account to explain this – yet another – embarrassment in his Liberal-run health-care system, right here in Bradley’s own city? A patient sits waiting in Jim Bradley’s health-care system, having a heart attack, and is essentially ignored for hours - and this is the wonderful single-payer, universal health monopoly which Jim Bradley approves of? Shameful - and probably unconstitutional as well. McCreith/Holmes, where are you? Ontario needs your decision now! We can no longer succumb to Liberal health-care hostage takers like Dalton McGuinty and Jim Bradley and their dangerous monopolistic ideology. I hope Jeff Blay noticed how, since he wrote the above letter, 32 C.difficile infected patients ended up being killed in Jim Bradley's Liberal health-care prison-monopoly, right in Niagara. I hope Jeff Blay writes another letter about that. I hope Jeff Blay contacts Liberal Jim Bradley, and asks Ole Jimmy why he and his McGuinty Liberals were hiding from being made the subjects of scrutiny during the outbreak that was going on in Liberal-monopoly-run Ontario in 2008 - when Blay was writing his first letter! Yeah: I hope Blay then asks Jim Bradley why the Liberals shouldn't be held responsible for homicide in the subsequent 32 Niagara C.diff deaths in 2011. The St.Catharines Standard or Niagara This Week sure won't be asking their buddy Ole Jimmy 'bout that! All the recent Niagara Health System (NHS) debate has unfortunately focused on where the new hospital is to be, but we should be looking at what the NHS is. It is a failing, Liberal government-run, unaccountable monopoly. There is no patient choice in this system. There is no competition for its services. There is no other alternative available. Ontarians are forced to take whatever the government deems fit to give. Patients are at the mercy of bureaucrats and their political masters. There are systemic problems with our health care system which are inherently related to the fact that it is a failing, government-run, one-tier monopolistic construct. The patient is at the mercy of a government more interested in single-payer ideology than in patient health. The concept of universal health care is not synonymous with single-tier, government-run monopoly health care - but that is what politicians want us to believe. When government decides to cut health care (as the Liberals just did by cutting $50 million from nurse hiring; or by amalgamating and consolidating health care services; both under the guise of 'saving money') the patient suffers: yet, we have no other choice elsewhere in Ontario to obtain our health care when the government fails to deliver. The NHS is solely funded by Dalton McGuinty's majority Liberal government. The LHIN is a Liberal-government created, appointed, and funded construct as well. The Liberal government and the Minister of Health are responsible for the conduct of the NHS. But why isn't the press discussing WHY this 'organizational review' was called for, in the first place? Despite my repeated requests, a smug, secretive Jim Bradley has refused to answer or publicly explain why this occurred in his Liberal-run health monopoly - under his watch, and right in his own city. Why isn't anyone asking why Jim Bradley and his Liberals did not immediately launch an independent investigation into the 2007 CIHI results? Then later, in 2008, we saw the Liberal majority government of Ontario again hide from scrutiny and accountability, by denying the ombudsman the ability to investigate McGuinty's health monopoly - which killed nearly 500 people (that we know of) in a system-wide C. difficile outbreak. We have also seen the Liberals deny that there is any link to the CIHI-uncovered death-rate and the Liberal's health care funding. On the other hand, the NHS consistently says that they are rationalizing to save costs, to meet budgets, to eliminate deficits - which all link back to funding! Yet - who set those guidelines, if not McGuinty's Liberal government ?! Where are the billions raised from McGuinty's Liberal Health Tax? Once again, to the detriment to patients, McGuinty is cutting health care to ostensibly ‘save costs’ – yet his Liberals still continue to chain patients, forcing them to wait in Ontario’s no choice health care monopoly. Perhaps soon the court decision in the McCreith/Holmes charter challenge will be announced, showing the unconstitutionality of McGuinty’s single-tier health care monopolism. “Soaring costs could force most provinces to spend more than 50% of their revenue on health care by 2036, says a new report, which urges Canadians to consider alternatives to the status quo if they "want a sustainable, high-quality health care system." "Over the past 10 years, health care spending in nine out of 10 provinces has grown at an unsustainable rate," said Brett Skinner, the lead author of the Fraser Institute report. "Unless governments find a better way to finance health care, then provincial governments will likely be looking at tax hikes, further rationing of medical goods and services, or ugly trade-offs with other important spending areas." 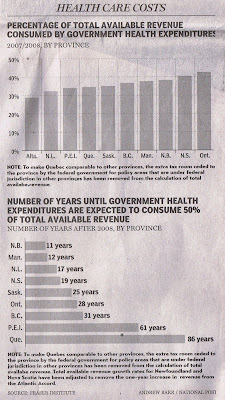 According to the study -- "Paying More, Getting Less" -- provincial spending on health care is growing faster than revenues with six of 10 provinces projected to disburse more than 50% of all available revenue on health care by 2036. Leading the way is New Brunswick, which is expected to reach the 50% threshold within 11 years. Manitoba could hit that target within 12 years. Newfoundland and Labrador will likely reach the 50% point within 17 years, followed by Nova Scotia in 19 years. Saskatchewan could take 25 years to reach the 50% point and Ontario 28 years. The report recommends several changes to Canada's public health system, such as legalizing the right of patients to pay privately for all types of medical services and permit for-profit and non-profit health providers to compete for the delivery of publicly insured health services. Canadians need to consider alternatives to the status quo if we want a sustainable, high-quality health care system. Doing nothing means that Canadians will continue to pay more and get less when it comes to health care," Mr. Skinner said. The report by the conservative think-tank predicts that British Columbia will likely take 31 years to reach the 50% point, followed by P. E. I., 61 years and Quebec, 86 years. Alberta is the only province where total revenues have grown at a rate comparable to health care spending during the past 10 years. The Liberals should have long ago acknowledged that both their health-care ideology and their health-care monopoly are failing. The Liberals should have long ago planned for a phased-in and tempered transition to a moderate private/parallel system, rather than play with patient health by gambling on winning the McCreith/Holmes health-care court challenge. We can't rely on McGuinty's political health-care pipe-dream promises much longer. So the Liberal liar Dalton McGuinty is now cutting some fifty million dollars in funding for new nurses. Remember, this was the same sanctimonious McGuinty who during the election (just one year ago) was bragging and promising that he would be ‘hiring another 9,000 nurses’ - but he didn’t even hire the 8,000 nurses which he had promised in his first term, and now we see the Liberal Healthcare Duplicity starting all over again. Liberals are also "delaying" 50 proposed family health teams, to "save" another 3 million dollars. McGuinty says this will ‘save money’ - but he neglects to mention how much harm his Liberal health-care cuts will cause to patients who have no other choice but to be forced to wait longer for treatment in his Liberal government–run health monopoly. What a scam this McGuinty is running. Where did the billions of Liberal Health Tax dollars go – wasn’t nurse funding supposed to be included in that?? Why isn’t the Health Tax specifically allocated solely to health? Or were McGuinty’s Liberals just using the Greg Sorbara Health Tax as 'extra' revenue to coast on over the last few years? Of course last year during the election, McGuinty was warned - and chose to ignore - that the economy was faltering: he kept on making his outrageous election spending promises nevertheless. As McGuinty continues to whine about his equalization payments, he gave away over a billion of 'no strings attached' infrastructure money to cities several months ago: now he’s forecasting a deficit! McGuinty’s Liberals have not dropped the rate on their high provincial sales tax, nor on their corporate tax. The Ontario manufacturing sector has crashed under five years of McGuinty Liberalism. Ontario health care will also suffer due to McGuinty's ideological health-care monopolism. McGuinty and his Liberal government should cut their ideology, not health-care. The old Falls Mist Motel (a U-shaped building sporting an outdoor pool in the centre of its parking lot, merely a "stroll to the Falls" as their old sign below said) on the north-west corner of Stanley Ave. and Murray St., was torn down in the summer of 2008, to be replaced by another Tim Hortons chain coffee outlet. There just aren't enough Timmy's built yet, I say. But at least from the front of this one, looking straight down Murray St., you will actually be able to see a bit of the American Falls, as well as the upper Niagara River. above: Aug.5, 2008. Looking east along Murray St., towards Stanley Ave, the Falls Mist Motel is under demolition. The Skylon Tower is in the background. above: View of motel from across Murray St., July 29, 2008.
above: Same view on Aug.11, 2008. Only a partial wall of the motel's ground floor remains. above: Same view on Aug.11, 2008: the Falls Mist Motel is demolished. above: July 29, 2008 closer view at the NW corner of Stanley Ave. and Murray St.
above: same view on Aug.11, 2008 - motel has been knocked down. above: July 29, 2008. View of motel site looking east along Murray St. Note mature tree in front. above: Same view on Aug.11, 2008. Motel is gone. above: Aug.20, 2008. Same view - note now the tree has also been cut down. above: Aug.20, 2008. The forms are in place for the new building's foundation. above: Aug.25, 2008. Concrete walls have been poured. above: Aug.26, 2008. Gravel fill delivered inside foundation walls. above: Aug.28, 2008. Gravel being compacted. above: Sept.2, 2008. Trenches cut for pipes. above: Sept.4, 2008. Pipes installed. above: Sept.8, 2008. Structural steel installed. Gravel laid on exterior grade. above: Sept.11, 2008. Roof trusses installed. above: Sept.17, 2008. Roof sheathed, wall framing in progress. above: Sept.22, 2008. Inside concrete floor has been poured, insulation underway. above: Sept.24, 2008. Glazing and doors installed, vapour barrier being installed, upper canopy facade framed. above: Oct.2, 2008. Canopy ready for stucco application. Brick piles ready for installation. above: Oct.17, 2008. Stucco and brick being installed. above: Oct.22, 08. Concrete curbs installed. below: The new Timmy's street sign arrives ready for installation, Nov.3, 2008 above: Nov.3, 2008. Logo installed on canopy. Equipment and supplies arriving. Lot is paved. above: Nov.13, 2008. Grass has been placed. Street sign is now installed and glowing in the misty Falls night. Soon will we raise a cup of java in warm memory of the good times at the old Falls Mist Motel. below: The store opened for business on Nov.15, 2008. Another Timmy's clone is born! above: Dec.13, 2018. The same Timmies is now undergoing a renovation!! Well: it has been exactly 10 years since the place was built! They have cut off the beige upper canopy on most of the facade, leaving some at the left side; they've put some brown wood horizontal paneling around the middle door, and added a fakey stone veneer over the previous brick veneer. The store's still open during the reno. Back in 2018, a lot of the workers were coming in from the Hilton construction which was occurring across the street. Now, in 2018, a lot of workers are coming in from the new concert hall which is being built across the street, right beside the Hilton. Above: The rear (west side) of the Niagara Falls Fallsview Hotel (Ontario, Canada) with its surface parking lot in the foreground; view is looking south-east from Stanley Ave, Apr.9, 2008.
above: same view, Aug.26, 2008; as an underground parking structure is being built. above: same view on Oct.20, 2008: the parking structure has reached back up to ground level. below: Fallsview Hotel parking lot as seen Apr.9, 2008. View is looking south; Stanley Ave. is along the right side of photo; the fencing at the far end of the paved lot faces Dixon St. The city sidewalk and one lane of road along Stanley Ave., which can be seen at the right, were fenced off during the excavation. The excavation went right up past the grass strip to the lamp posts on the curb, yet the curb and the lamp posts remained at the edge of the steep slope untouched for the duration of the excavation, as seen in the following photos. above: same view; the excavation is underway, as seen May 13, 2008.
above: May 26, 2008; the tiered-excavation deepens; forms have been placed along the Stanley Ave. side for concrete walls. above: Jun.6, 2008. Concrete walls already poured along Stanley Ave., more forms are in place along the north side of the excavation. Note lamp posts remaining at edge of slope. above: July 29, 08, the outside trench is slowly back filled. Inner tier of structure under way. above: Nov.18, 2008, the trench has been backfilled, and construction vehicles can now drive from the road right onto the new deck.